In a small saucepan, combine the orange juice, 1 tablespoon of oil, salt and pepper, to taste, the ground ginger and cayenne pepper. Simmer for 2 to 3 minutes, whisking until reduced to a thick consistency. Remove from the heat, pour over the sweet potatoes and toss to coat. Rub 2 teaspoons of remaining coconut oil on a rimmed nonstick baking sheet or use a silicone liner and omit oil. 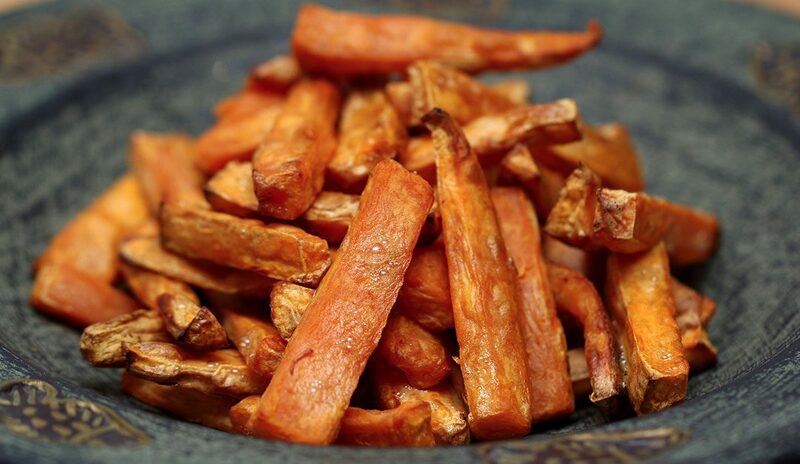 Arrange the sweet potato strips on the prepared baking sheet and bake until brown, about 25 minutes, turning after about 10 to 12 minutes. Remove the baking sheet from the oven and transfer the potatoes to a serving dish.